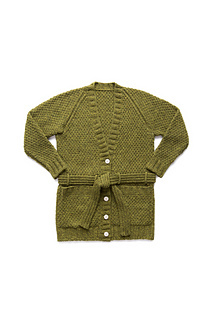 Knit up a smoking jacket-style cardigan in Quarry for a plush and cozy outer layer this autumn. The overall fabric of moss stitch creates gentle texture that shows off Quarry’s flecks and striations, and a subtle A-line shape with raglan shoulders makes Tamarack easy to wear. Choose between a short ribbed band for the fronts or a shawl collar band shaped with short rows. Optional patch pockets and a belt secured with i-cord complete the look. 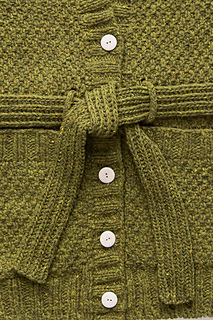 Correct length of the one-piece yoke is dependent upon achieving the stated row gauge. 32” circular needle can be used instead of DPNs if using the Magic Loop method for working small circumferences in the round (e.g. Sleeves).